“Don’t they have to wear helmets?” is a question quite commonly asked by our guests on tours in Greece, on observing the many individuals seen travelling on motorbikes or mopeds without wearing any protective headgear. The truth is that the wearing of a helmet is indeed obligatory, but for one reason or another, some modern Greeks dislike wearing them (as do many summer tourists from countries where helmet use is more consistently policed, but who seem to assume that the laws of physics are suspended while on holidays). It wasn’t always so. 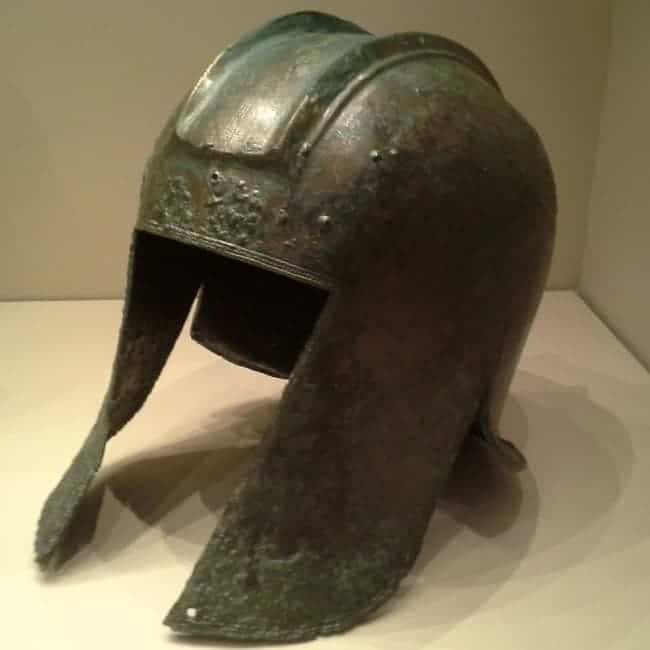 In antiquity, helmets were not only worn for reasons of practical necessity, they also represented the role and status of their owners, expressing their identity as warriors. Our example is a wonderfully well-preserved helmet from the 6th century BC, discovered in a grave at Aiani in the Greek province of Western Macedonia. Aiani is a fascinating site where important archaeological discoveries have been made over the last two decades, but it remains largely unnoticed by the travelling public. This is in spite of the fact that since 2008 it is home to a truly superb archaeological museum housing a wealth of extraordinarily fine finds, well-displayed and comprehensively labelled. 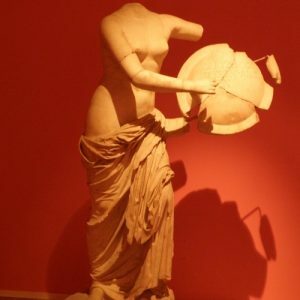 We are especially happy to be able to include the site and museum in our tour From the Slopes of Mt Olympus to the Shores of the Aegean – the Archaeology, Food and Wine of Macedonia, on which it will be one of many fascinating highlights, but probably one not expected by most of our guests. A bronze shield-cover (a very rare find, as shields were usually made of wood and linen), reassembled from hundreds of fragments , at Aiani museum. Excavations have elucidated much of the site’s history, and they continue to do so. It appears that Aiani, set in beautiful and fertile hill country overlooking the river Haliakmon and setttled already in prehistory, became a major regional centre in the Early Iron Age. By the Archaic period, the 7th and 6th centuries BC, it was a key centre of power in its region, namely the kingdom of Elimiotis, itself a constituent part of the loose entity then known as Upper Macedon. Although the ruler of Lower Macedon, the wealthy lowlands centred on sites like Aigai (Vergina) and Pella near the Aegean coast, was recognised as “King of Macedon” by the Greeks since at least the early 5th century BC, the reality was more complicated. Especially in Upper Macedon, there were multiple small kingdoms, each ruled by its own royal family, all of them interlinked by common ancestry (real or imagined), those links constantly reinforced by intermarriage. From this point of view, the Macedonian king was more of a primus inter pares, a situation that prevailed until Philip II united and centralised Macedon in the 340s BC, making his realm a great power and laying the groundwork for his dominance over Greece and for the conquests of his son, Alexander the Great. Apart from the site itself, which will be the focus of a future post, the key finds at Aiani come from its cemeteries. As we recently discussed, places of burial tend to be a central aspect of archaeological evidence and a rich source of artefacts. At Aiani, there are a few built tombs, probably belonging to local royalty, but the majority of burials were inhumations in simple pit graves. Their rich finds indicate that they contained the remains of the area’s nobility. Female burials are accompanied by jewellery and domestic items, male ones mostly by weaponry, making the site a key source of such material, including a very rare bronze shield-cover, painstakingly reassembled from hundreds of fragments. 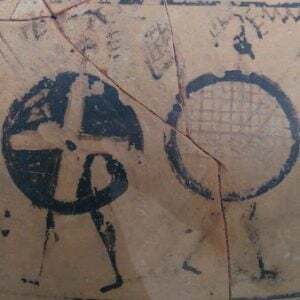 This indicates that one of the central roles of (upper-class) men in Aiani was their status as warriors, hardly surprising in a culture as warlike as ancient Macedon. 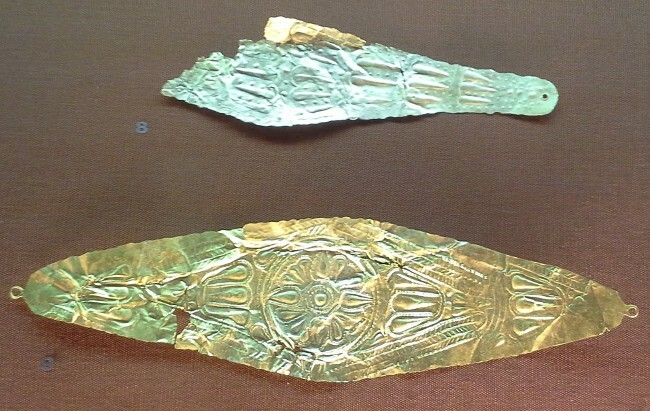 Golden “mouthpieces, a typical Macedonian find, placed over the mouths of the deceased, probably for protective reasons. 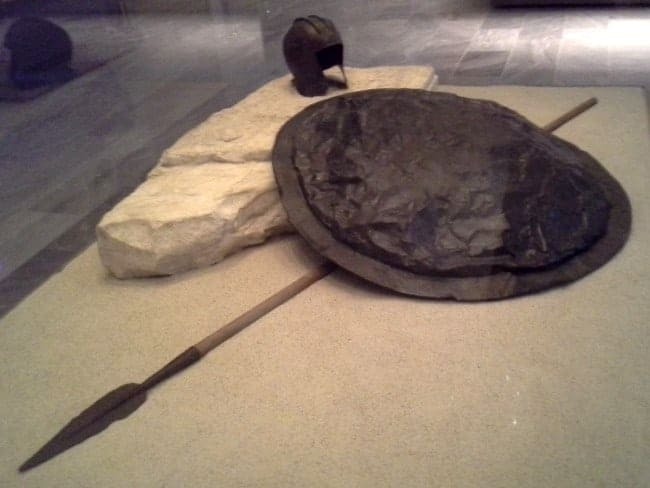 Thus, our 6th century helmet – its practical necessity in warfare apart – was probably a prized possession of its owner. It is unlikely that most fighters of that time could afford a full bronze helmet, so our specimen is an object that expressed his being a “big man” , a man of wealth and importance, involved in a central aspect of his homeland’s existence: its defensive and aggressive potential. The helmet’s shape is quite typical for the area and era.It is hammered from a single sheet of bronze and offers good protection for the back and top of the head as well as the cheeks, while leaving a fairly open field of vision to its wearer. Traditionally, archaeologists have called such helmets “Illyrian helmets”. That is because many of the first examples to be found (in the 19th and early 20th centuries) occurred in the area antiquity knew as Illyria, which includes parts of today’s Albania, Croatia and Montenegro. By now, we know that this is a misnomer: the type was developed in the Peloponnese in Southern Greece in the 8th century BC and then spread throughout the Balkans and beyond. Now, it is often described more neutrally as a “helmet with a rectangular cutting for the face” (which doesn’t exactly roll off the tongue). A late 5th-century Athenian import at Aiani: a lekythos (vessel for olive oil) showing a young athlete washing. The Peloponnesian origin of the helmet type chimes well with most of the material found at Aiani and comparable sites. Although the ethnic identity of the ancient Macedonians was and is controversial to some extent and was already hotly discussed and disputed by the ancient Greeks themselves (for example, Herodotus – whose authority is considerable – took the time to explain that the Macedonians were Greeks) the finds do not just indicate strong connections with Greek culture, but integration into it – most of them would certainly not appear out of place much further south in terms of material culture, religious beliefs, social values and even language. Like elsewhere in Greece (and beyond), there are many Southern Greek imports, especially Attic pottery, but the most remarkable evidence comes in the shape of 6th and 5th century BC pottery bearing inscriptions in Greek, making Aiani a key findspot for such material and indicating that there was a “target audience” for Greek writing. We do not know whether the unnamed warrior from Aiani enjoyed wearing his helmet, but we can assume that it was part of who he was, or as whom he was seen and wanted to be seen, which also applies for his peers. 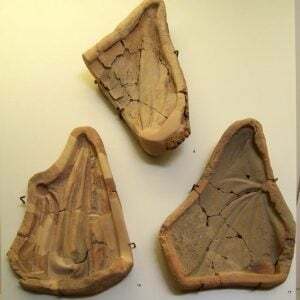 What we do know is that it is a beautiful and informative object, part of an extraordinary story about the people and peoples that inhabited one of Europe’s most fascinating regions throughout many millennia from prehistory to present. We will tell you that story hands-on during our From the Slopes of Mt Olympus to the Shores of the Aegean – the Archaeology, Food and Wine of Macedonia tour.